The Reign seem to have left their mojo in California. Friday’s 6-3 loss to the Victoria Salmon Kings was their second straight in the three-game series in British Columbia. The Reign (2-3-0-1) got goals from Luke Beaverson, Jordan Morrison and C.J. Stretch, but four Victoria goals in an eight-minute span of the second period put the Reign in a 5-1 hole from which they couldn’t dig out. Goaltender Kellen Briggs started and allowed three goals on 15 shots, including the first two in the Salmon Kings’ second-period outburst. Making his Reign debut, Beau Erickson was summoned from the bench at 2:45 of the middle period, and proceeded to stop 19 of 22 shots in relief. The Reign coudln’t convert any of their five power-play chances, and are now 1-for-12 with the man advantage in two games in Victoria. Six different players scored goals for the Salmon Kings (4-2-0) and eight different players had an assist; only former Reign defenseman P.J. Atherton had two. Stretch, playing on a line with Morrison and Chaz Johnson, assisted on Morrison’s goal with 2:03 left in the first period. The Reign didn’t score again until Beaverson’s rocket from the point with 2:45 left in the second (Shawn Collymore and Lane Caffaro got the assists), but by then it was 5-2. Johnson had the lone assist on Stretch’s first goal of the season, and the second of his pro career, at 1:21 of the third. Caffaro might have had the best stastical night — he finished a plus-2 on a night when only one other Reign player (defenseman Chad Starling) had above an even rating. The two teams play again tomorrow night at the Save-On-Foods Memorial Center. The Reign had their chances in Victoria, but not nearly as many as the Salmon Kings. The Salmon Kings led by scores of 2-0 after one period, and 3-1 after two, before Shawn Collymore’s second goal of the season drew the Reign within 3-2 at 1:24 of the third period. But that was as close as they would get. Chad Painchaud’s second goal of the game made it 4-2 at 6:15, and Milan Gajic closed the scoring at 12:16 of the third period. 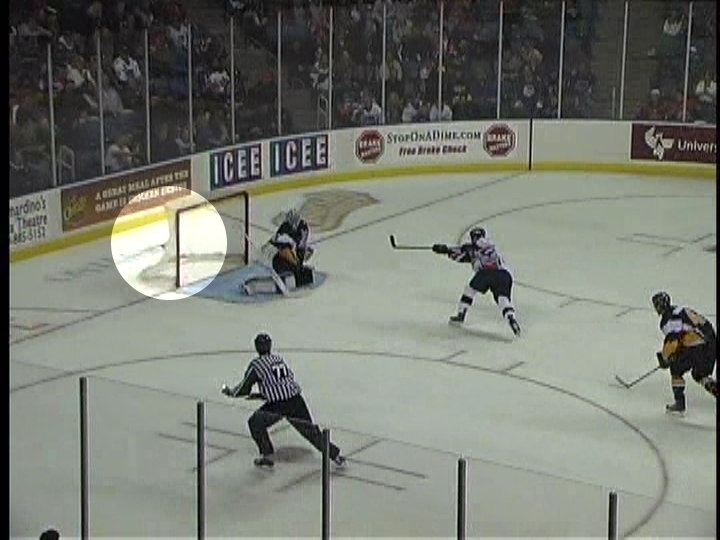 Kellen Briggs stopped 29 of 34 shots in a game in which the Reign were outshot 34-27 despite having seven power plays to the Salmon Kings’ three. Kyle Kraemer’s power play goal at 14:25 of the second period got the Reign on the board against goaltender David Shantz, who stopped 25 of 27. Center Tim Kraus and defenseman Lane Caffaro, acquired Monday from the Idaho Steelheads, had assists on both goals. Reign will face ex-NHLer tonight. Quintin Laing, who has played in 79 career NHL games – including 36 last season for the Washington Capitals – will suit up for the Victoria Salmon Kings tonight against the Reign. The 6-foot-2 left wing “may be the biggest name we’ve had here [during the Victoria ECHL era],” Salmon Kings GM and head coach Mark Morrison told the Victoria Times-Colonist. The Reign won’t face former Kings prospect and Torrance native Gabe Gauthier, who was signed by the AHL’s Syracuse Crunch shortly after he signed in Victoria. They can expect to see defenseman P.J. Atherton, who eight goals and 21 points in 33 games for the Reign in 2008-09. Atherton has a goal and four penalty minutes in four games for the Salmon Kings. The game is scheduled to begin at the Save-On-Foods Memorial Center at 7 p.m.
(More) Ron Hextall on Martin Jones. A little while back Ron Hextall, the Kings’ assistant general manager and GM of the Manchester Monarchs, said he wanted goaltending prospect Martin Jones to come to Ontario to get some regular playing time. He also wanted a more experienced #3 goalie with the Kings’ AHL affiliate club than Jeff Zatkoff; Erik Ersberg fit the bill after he was assigned to Manchester by the Kings. Since then, Jones has left Ontario for Manchester and Ersberg is gone. So what’s next? Lane Caffaro is the newest member of the Reign. The 26-year-old defenseman was acquired today from the Idaho Steelheads for future considerations. Caffaro has played in 25 AHL games and 32 ECHL games in his pro career, beginning with a four-game stint in 2008-09 with the AHL’s Wilkes-Barre Penguins following his four-year career at Union College (Schenectady, NY). In two games this season, he has no points and seven penalty minutes for the Steelheads. The plan Monday was for Caffaro to drive to Ontario from Boise, then fly with the Reign to Victoria, British Columbia, for a three-game series beginning Wednesday against the Salmon Kings. Defenseman Eric Doyle was injured and didn’t take part in practice, and Brett O’Malley was wearing the red jersey reserved for non-contact players. Defenseman Pat Bowen, acquired last week from Greenville, was healthy and set to go into the lineup but won’t be able to play in Victoria due to a passport issue. The specific issue? He doesn’t have one. Jordan Morrison was skating with Jeff Corey and Jon Francisco, and Pierre-Andre Bureau took Morrison’s place on the line with Shawn Collymore and Chaz Johnson. New goaltender Beau Erickson – who was available for both ends of the weekend series against the Stockton Thunder was nearly perfect in an end-of-practice shootout drill, allowing only a goal to Tim Kraus. Johnson, Chad Starling, Collymore and Matt Delahey put shots past Kellen Briggs. Much, much more in tomorrow’s editions of the Sun and Daily Bulletin, including comments from the ECHL’s Director of Officiating on Saturday’s goal that wasn’t. Kings place Ersberg on waivers; implications for Reign. Today we learned the real reason why Martin Jones was recalled by the Manchester Monarchs: Erik Ersberg wanted out. Coming off three seasons in the NHL, Ersberg probably didn’t want to spend this season in the American Hockey League, which led to him being placed on unconditional waivers today by the Kings. Rich Hammond reports on LAKingsInsider.com that Erbserg is expected to join a KHL team; the 28-year-old Swede has never played in the KHL. We’ll know more at 9 a.m. tomorrow, once the 24-hour waiver period has ended, but don’t be surprised if this is the last the Kings (or their minor-league affiliates) have seen of Ersberg. What does this mean for the Reign?